The beauty of art is more than the end result. Yet another form of storytelling, art is everything that goes into the process — the artist inspiration, their experiences, and the larger cultural landscape. Everything is woven into the canvas. When the Luminary approached TOKY to create a multimedia capsule campaign for Lot 49, their annual auction, we took it as an opportunity to explore all facets of storytelling, from the art and the artist to the medium itself. The core value of the auction was that this was art for the artists. 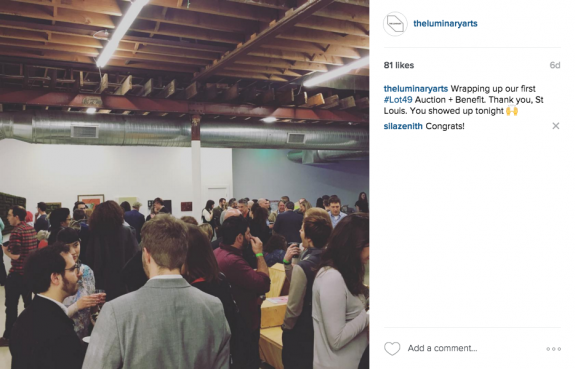 Fellow artists nominated participants, and 51 percent of the auction proceeds went directly to the artists, while 49 percent went to The Luminary’s special projects. TOKY’s approach needed to reflect similar values. Going into this, we knew that we had about a minute to feature each of five artists — one completely different from the next. We didn’t have time to go into great detail, so we created vignettes. Each artist talked about their work and the specific piece they were donating to the auction. The goal was to pique the interest of viewers, so they would attend the show to see the work in person. And bid! TOKY created a series of five vignettes, each on a featured participating artist, to showcase the variety of approaches and perspectives compiled in Lot 49. To compliment the vignettes and create a fully branded experience, the auction’s visual identity leads into each video. As a show and auction built on the concepts of identity and community, we wanted to make their campaign personal and invitational. TOKY designed a social media messaging strategy and ad campaign that used Facebook and Instagram to raise The Luminary’s profile among potential art buyers and increase ticket sales. 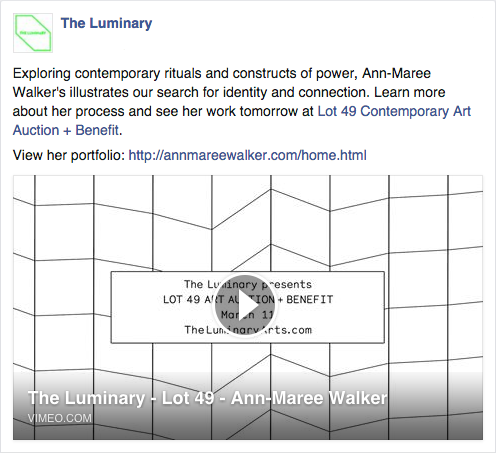 Messaging and promotion for the auction campaign gave The Luminary’s Facebook audience a look behind the scenes. Paired with videos, the post copy provided insight into the inspirations and thought processes of each featured artist. In keeping with the unique approach and balance of the auction, the posts sought to drive traffic to the artists’ pages and portfolios, making the campaign beneficial for participant and gallery alike. The approach on Instagram gave viewers a behind-the-scenes glimpse into the life and passion of a gallery and community-supported show. This wasn’t going to be a snobby show; this was a show driven by love and conviction in the value of the pieces, much like the ethos of The Luminary itself. With nearly 400 attendees, Lot 49 was a massive success. One thing the directors heard consistently from both artists and audiences was that the social media messaging, videos, and design worked exceptionally well together to create a complete experience. 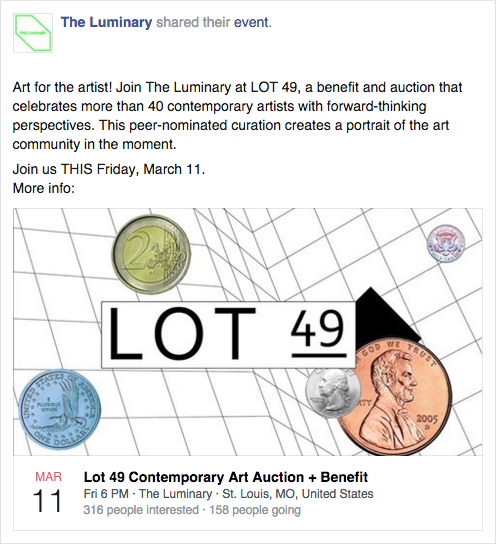 The multimedia approach and commitment to the gallery’s values communicated The Luminary’s vision authentically, and the vignettes were shared so extensively online that Lot 49 was difficult to miss in the days leading up to the event. The in-studio videos created by TOKY for our inaugural Lot 49 event managed to seamlessly document each artist’s unique vision, while building to a greater sense of the St. Louis art community and promoting the auction itself. The videographers clearly were able to enter into the process as artists themselves, capturing the textures nuances of creative practice. The artists remarked that the videos became one of the most valuable records of their practice they have and we heard from audience members that the videos “were like Art21 videos for emerging artists.” More practically, the videos gave us a tangible tool to help get word out about this inaugural event, showcasing that Lot 49 is not only a benefit for The Luminary, but an event meant to support the artists with work with on a daily basis. 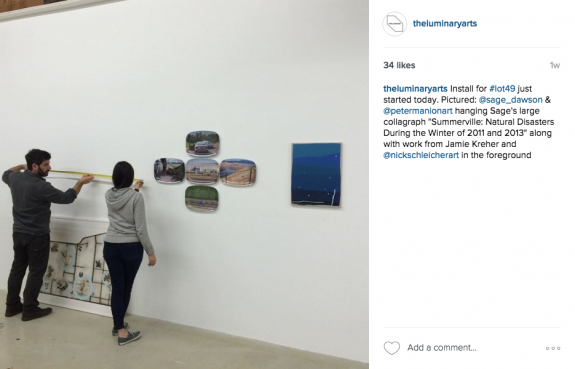 The Luminary dedicates itself to being a standard-bearer for emerging, global art talent. They have worldwide recognition as a fierce voice for independent and world changing artists. This St. Louis incubator wants to see art thrive locally and foster St. Louis’ reputation as part of the larger global art community. We can’t help but get behind that. The full videos are below.